So, you’ve found an image you like on Houzz, Ava Living, or any of the thousands of other websites or blogs dedicated to interior design, and you decide you’d like to have a room (or chair or even paint color) just like the one in the picture. You leave a message for the designer asking where they got it, or what paint color it is, what contractor they used, etc. – and either get no response, or the designer won’t or can’t tell you. Or tells you to hire them and they’ll be happy to help you with your project and sourcing something similar. What’s going on? Especially on a site like Houzz that seems to be dedicated at least in part to helping do-it-yourselfers source and create their own designs? I mean, how dare those designers not just answer a simple question like this? Or want to be paid for the information no less? Well, there are a few likely reasons you may not get an answer to your question (or the details you are seeking), as follows. Yes, it’s highly likely it’s just that simple. There can be literally thousands of products and decisions involved in a single design project (even a single room), and we simply can’t remember everything for every project we ever do. No one can remember all the details even in a current project, never mind something finished years ago. Yes, a good designer certainly keeps records, but the time involved to look up a detail from an old project whose records may even be offsite in storage or otherwise archived simply isn’t usually worth the sometimes considerable effort, particularly when we know we’ll never see a penny of income for doing so. It also actually costs us money and time to look things like this up, both outright in paying staff to do it, or simply in opportunity cost because it’s time that could otherwise be billed to a paying client or marketing to find new ones in order to access information like that. And especially if we happen to be on a tight deadline right when you ask, well, paying clients simply always come first. Much of what a professional interior designer does is custom designed specifically for the project shown, and thus not available anywhere anyways. Ditto with even paint colors – they are often custom blended for that particular project, and thus can’t be purchased anywhere but through that designer (and maybe not even then). Or maybe it’s an antique or other one-of-a-kind piece for which a duplicate also doesn’t exist anywhere or could never be easily found. Or we know it’s been discontinued. Many more of the resources we use are only available “to the trade”, meaning only to professional designers. So, just like with anything fully custom-designed, even if we were to tell you where we got it and exactly what it is, you wouldn’t have access to be able to buy it on your own anyway. If we share names of contractors or vendors with non-clients, and someone has a bad experience with them, it can reflect poorly on us – through no fault of our own – and may also raise concerns about liability and/or negatively impact our own working relationships with these people. One or another of these problems has happened to virtually every designer (I know it certainly has to me), and no one is eager to repeat the experience. Trying to help people out like this can and does backfire, and it makes us very wary of what resources we share, and with whom. Many of the sources we use work either exclusively or primarily with designers, and expect a certain level of design knowledge of the client, which the average DIYer lacks. This mismatch of expectations can lead to a poor outcome, or at least disappointment on the part of the client who doesn’t fully understand what they’ve gotten themselves into or how to explain what they envision so they actually get it – or how to get it fixed if something goes wrong or it just doesn’t turn out like they’re expecting. It can also frustrate and upset the vendor or contractor, and these are people we like to keep happy, not annoy, because we want to be able to work with them again ourselves. Particularly on sites like Houzz, we often have an idea of the budget you may have, because you’ve either said so straight out, or it’s reflected in your comments on other discussions, or your ideabooks, etc. When someone is looking to somehow furnish an entire room (or God forbid, a whole house) for $10,000, for example, and we know that the table or cabinet or one similar to the one you’re asking about will easily cost double or triple that or more by itself, what’s the point? We’re not going to tell you right out that you can’t afford it, of course, but we are also not going to go out of our way to look up the specifics for you, either, when we already know there’s not a prayer on earth you’ll actually be willing or able to buy it, from us or anyone else. In all cases, someone else paid for that design and every component you’re asking about, and deserves some protection against other people copying it, especially for free. They certainly deserve particular protection against the actual designer they hired giving it away to someone else. The designer may also have absolutely no legal right to share the information because of contractual terms with the client involved, and could potentially face legal action for doing so. How would you feel if you had been the client to commission a design and paid good money for it – and then realized your designer was giving it or parts of it away for free to others? Or knew that people you know or might meet might query the designer about how much you paid for everything and where you got it – and get the answers? Frankly, the sources and vendors we use are a major part of our stock-in-trade, along with our design tips and tricks. Quite simply, why would we give away for free much of the proprietary information and resources with which we make our living? With which we are able to distinguish ourselves and the value of what we in particular do from other designers? We are professionals who are in business to make money, just like everyone else in any other business anywhere, and yes, part of being able to do that very much involves protecting the majority of our sources. One of the best reasons to hire a designer in the first place is that we maintain vast lists of resources, and know which ones to draw on for which purposes. It takes years and years, and constant, unending research, to find the best resources, contractors, etc., to build the list we draw on, to keep it current, and to develop and maintain the personal and professional relationships that lead to the best outcomes. I personally have literally thousands of listings just in my address book, compiled over several decades, and at least several thousand more bookmarked online and recorded, filed, or referenced in other places including a large library. That resource base is of absolutely incalculable value to me. When you hire us, you get the benefit of that vast storehouse of talent and materials – in combination, of course, with the our training and skill and ability to source just the right things in each situation and orchestrate a coherent whole that uniquely fills your personal requirements. We certainly don’t mind sharing a few things, and a few general pointers. Part of what we do does involve educating our clients, and an educated general populace can also produce better clients as well as raise the overall level of design and appreciation for good design in the world. It benefits everyone when we do share some of what we know, and most of us enjoy doing so anyways. I certainly do. But you know, please don’t ask us to give away the farm, or to go particularly out of our way to help you when you have no intention of ever paying us for anything – or to violate our contractual agreements with others. You wouldn’t give away the trade secrets of how you do whatever you do professionally, would you? Or provide all or a substantive amount of your services for free? Or honestly expect your doctor, lawyer, accountant, plumber, gardener, dog groomer, or car mechanic to work for free, or to provide parts or training in how to do it yourself, especially for nothing? If you’re ready to create the uniquely beautiful and functional home of your dreams, or even to just redo a single room, please drop me a note via the Contact link on this site and we can discuss your needs, and how my experience and vast resource base can help. 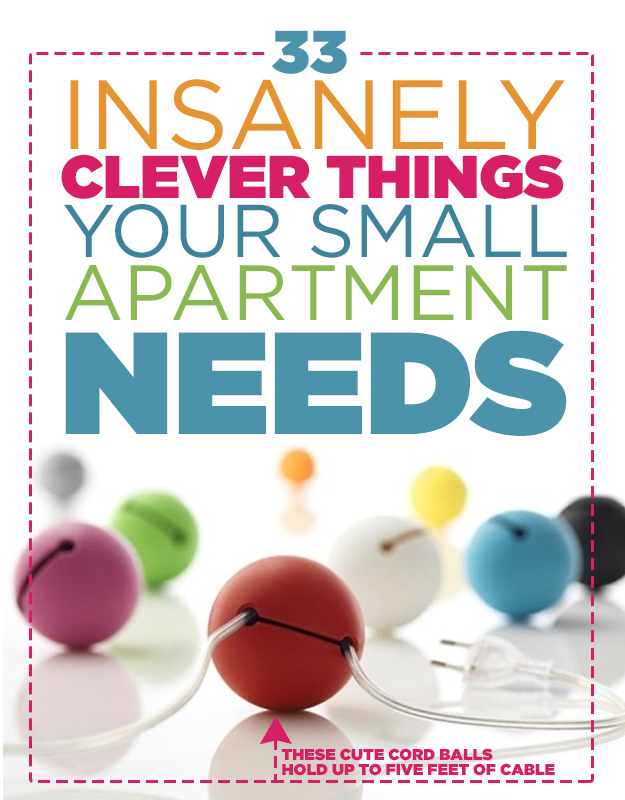 From Buzzfeed’s article “33 Insanely Clever Things Your Small Apartment Needs”, with thanks to Katy Wolk-Stanley, The Non-Consumer Advocate for pointing it out. Because sometimes, especially when you live in a really small space, you just need some things to make life easier, and these clever items do exactly that. Not all of the items shown in this Buzzfeed post are beautiful, but they are all divinely functional and useful, especially in a small home, and wonderfully carry out the “useful” part of the mandate of the fabulous William Morris, who opined that one should “[h]ave nothing in your house that you do not know to be useful, or believe to be beautiful.” This mantra of the Arts & Crafts movement has been a touchstone for designers and style mavens ever since. Personally, I believe that as much as possible should be both beautiful and functional. There’s simply no need to sacrifice style for practicality. If you’re ready to create a beautiful home that is also tremendously practical and functional for your lifestyle, whether your style is contemporary or traditional, and you’re not into doing it yourself, please drop me a note to get started! If I had a nickel for every time I’ve heard someone complain about a contractor who hasn’t done the job right, or hasn’t scheduled enough time for the job, or walked off the job in the middle never to be heard from again, leaving a mess in his wake, or who has taken so long to get the job done that an important deadline has been missed, etc., I’d be a wealthy woman. The cold, hard fact of the matter is that not only are there a lot of bad contractors our there, but the average contractor doesn’t give a rat’s patoot about you, Jane or Joe Homeowner. Sure, some are better at business than others and do recognize the importance of taking good care of their customers no matter who they are, and there are in fact some really fabulous ones out there – but the reality is that every single one of them is going to go on to their next job when finished with yours, while you are probably only going refinish your floor or redo your bathroom or put on an addition once in your whole life, and chances are you’ll forget who they are anyways the next time you do decide to do something to your house. You hear endless horror stories about contractors and remodeling, too, because the average homeowner simply doesn’t know what to look for or how to hire one and ensure the job gets done right, on time, and on budget. Most people simply have no clue about what they don’t know until they find themselves in the middle of a big, expensive mess. Most people also go about a remodeling project backwards, by hiring a contractor first, and then letting the contractor essentially end up dictating how the job gets done, only giving him very vague instructions. If you do that, you will end up with problems, and not with what you want, because it is absolutely essential to have the design completely finished and fully spec-ed out in every tiny detail down to the door stops, cabinet hinges, and edge trim on the countertops before you go out to bid. If you don’t, you won’t even be able to fairly compare bids because each contractor will be making it all up in his own head as he goes along since you haven’t specified everything. Incomplete design will always lead to cost overruns and a job taking far longer than you expected even if you hire the best contractor in town. It’s not really a personal failing if you find yourself in this kind of position; you just haven’t had any reason to know before, and we are simply not all experts in everything – nor should we be. This is simply not your area of specialization. Interior designers, however, not only do specialize in this stuff, living, eating, sleeping, and breathing it for decades on end, but we also get the design finished down to the last detail before putting it out to bid so that you can compare bids fairly. We know every detail that has to be planned. We also maintain solid working relationships with usually several top flight general contractors – and most importantly, those are ongoing relationships. This breeds loyalty as it does in any field in which collaboration and partnership are part of getting the job done successfully. We do know how to assess who is good and who is not, and how to level the playing field in the world of obtaining bids. We have backups we can call in quickly if an insurmountable problem does arise with one contractor during a job, and that does happen sometimes, even with the best of them and the best-planned projects. We know which contractors are best for which types of job, and only refer ones who we know are definitely committed to excellence and customer satisfaction. We are able to realize economies in working with a contractor that you can’t because of the working relationship one develops when doing multiple projects together, and because of having already-shared common professional ground and knowledge. When you work with someone regularly, and you share a professional knowledge base, you learn each others’ strengths and weaknesses, how they think, etc., and that ends up saving time, which saves you the client money – oftentimes a lot of money. These ongoing working relationships also help us during the design process. We can get feedback from the contractor about ways to do things that might save money well before the design is finalized and the work started. The most successful projects that involve construction actually start off with the designer and contractor collaborating right from the beginning. It is always, always, always cheaper for you-the-client to change a design on paper before starting construction (or purchasing) than once things are underway. But most importantly in some ways, and a big part of why these relationships matter to you the client, is that contractor knows that if he doesn’t get the job done right and take good care of the designer’s client, and absolutely get that work done in time for her to put her house back together for holiday visitors if that’s what is promised, the designer is simply not likely to call on him again for her next job. And the designer will have a next job for him, while you simply probably won’t. Which means, practically speaking, that he’ll take her call even if he might not take yours. He’ll be more likely pull guys off another job to finish yours if necessary where he might not without the designer being part of the equation. He’ll simply take better care of you in every way since he’s probably a better businessperson to start with than the one you might find on your own, but also because he definitely wants to keep that designer happy so she will bring him her next project. A good designer and contractor combination will also be able to tell you up front if the job can be done in the time frame you have in mind or if you’re dreaming and need to come back into the land of reality – before you even tear your house apart and start, or break ground on a new one. And a good designer will know to warn you about things a contractor might not – like how you need to plan on a certain level of cost and time overruns, and build them into your plans and budget. These overruns do still happen even with the best design and best contractors, because there are many things that can crop up in the course of even the best-planned project that no one on earth could ever foresee, but you simply minimize the chances of them (and the extent), and certainly minimize the likelihood of the most predictable problems cropping up when you work with an experienced designer who already has established trade relationships. If you’re ready to get going on that remodel or new house that you’ve been thinking about for so long, and want to make creating your dream home or room as easy on yourself as possible, saving yourself both time, money, and aggravation with one stop shopping, freeing you up to take care of other more important things in your life even while your project progresses, please contact me by clicking on the “Contact” tab above. I look forward to working with you! 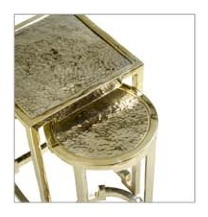 Every so often, a piece of furniture comes along that can only be described as a work of art, or jewelry for the home. These beautiful nesting tables are a prime example of this breed of goods – and vastly prettier in person than the images show. 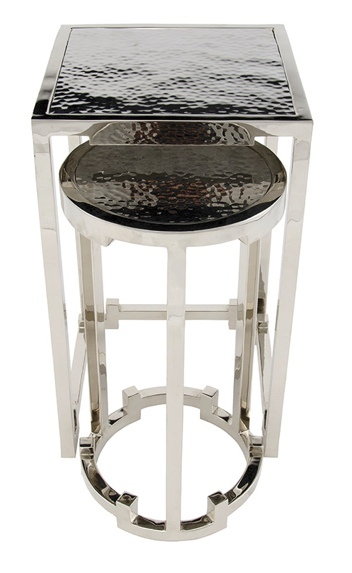 The gleam of the highly polished metal base contrasts with the sparkle of the hammered finish of the tabletops in these distinctly contemporary pieces, while the detailing of the bases recalls more traditional design – crenellated castles, anyone? The weight lets you know you are truly dealing with a quality piece, as does the sheer perfection of the finish and attention to detail. The finishes are like silk. 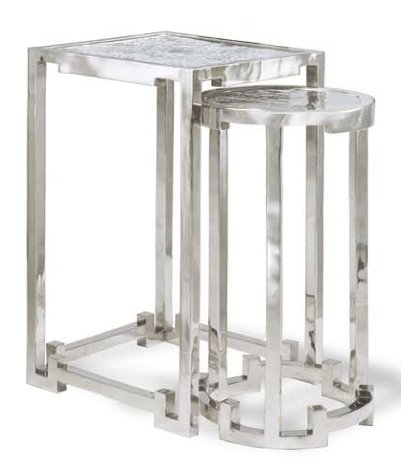 This is a magnificent melding of form and function in a pair of petite tables that will be at home almost anywhere. Made of bronze, these nesting tables are available in a variety of polished and patina finishes (11 in all), including the three shown here. Please contact me for pricing if interested in adding these jewels to your own home. This is a great report about a journalist in Chile who undertook living as a disabled person for two weeks. Even if you don’t understand a word of Spanish, the videos of his experiences will speak for themselves about the types of obstacles disabled people face every day in both their homes and in public. We are fortunate in the US that public spaces are generally much more accessible than in Chile, but the same cannot be said about our housing stock. As our population ages, more and more people will find themselves disabled to some extent and start to face these kinds of issues. Contact me today if you’re ready to evaluate your own home for accessibility as you and your loved ones age or cope with disabling illness, and to make necessary changes to enable greater independence for longer. Universal/accessible design just makes sense – for everyone. Esta es la primera parte (de un total de 4 videos), sobre la experiencia de Fernando Lasalvia, músico, cineasta y periodista, que experimentó por varios días vivir en ‘situación de discapacidad’. Es así, como se decide a vivir una vida independiente… Veamos cómo le va en esta primera parte, donde conoce a Tomás del Villar, deportista, Campeón Nacional de Esquí Paralímpico. From time to time, I come across some extraordinary antique finds and showcase them here on my blog. 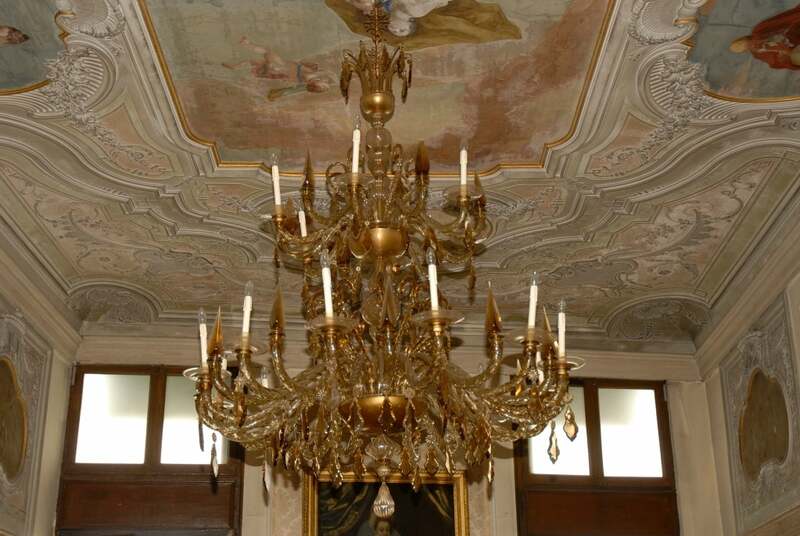 This is one of the more unusual and important chandeliers I’ve seen, and is in flawless condition. 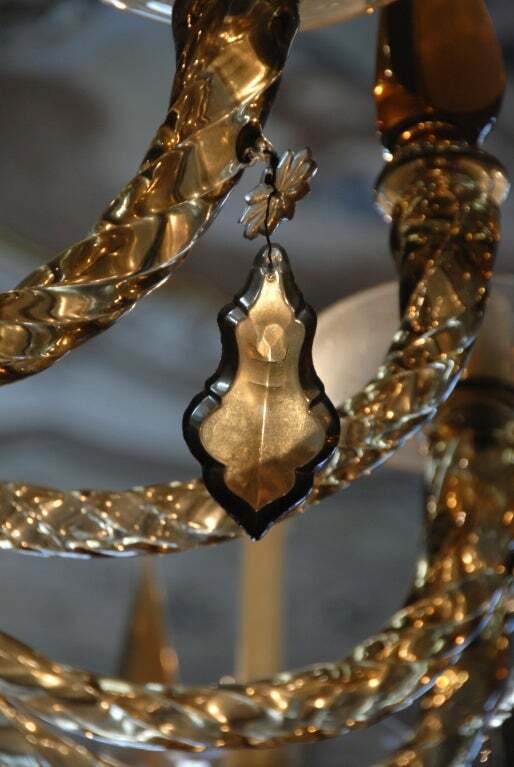 Scroll down past the description for closeup views, which show the detailing and sparkle. 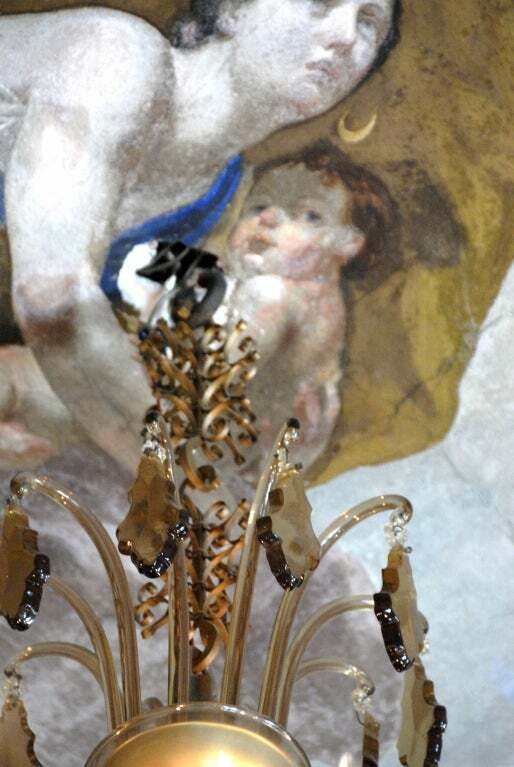 The famed Salviati company was instrumental in the revitalization of the Murano glass industry in the 19th century, starting with the development of a method of making mosaics with glass (tesserae), which subsequently found their way into some of the most important and well-known buildings in the world, including the dome of St. Peter’s in Rome, l’Opera in Paris, the Houses of Parliament in London. 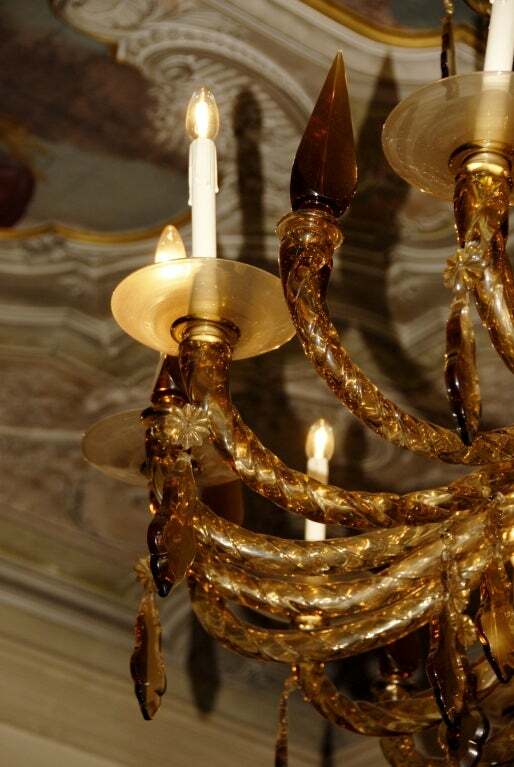 The company is also credited with the rediscovery and preservation of flameworking (lampwork), aventurine glass (also called goldstone), and opal glass. 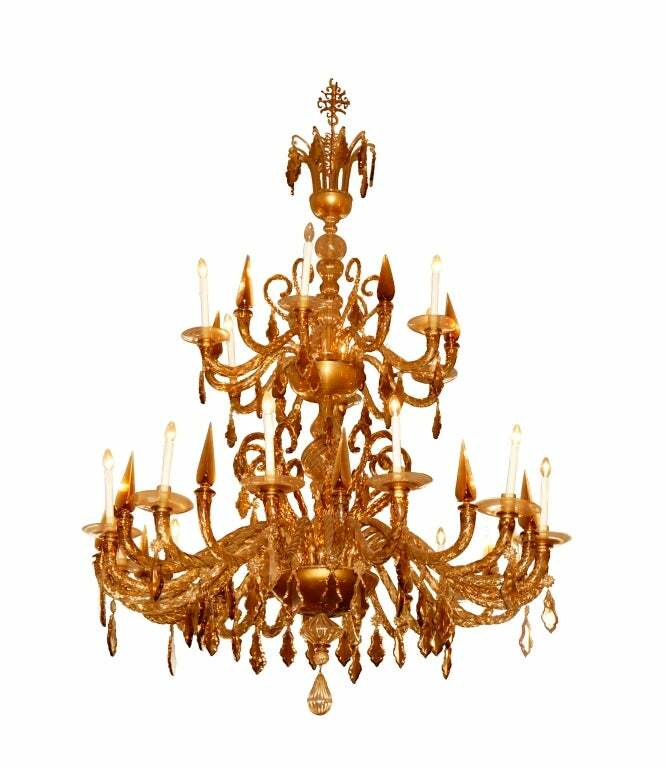 One of a kind amber crystal chandelier designed by Giulio Salviati (1843-1898) and manufactured by the Salviati company in Murano Italy. 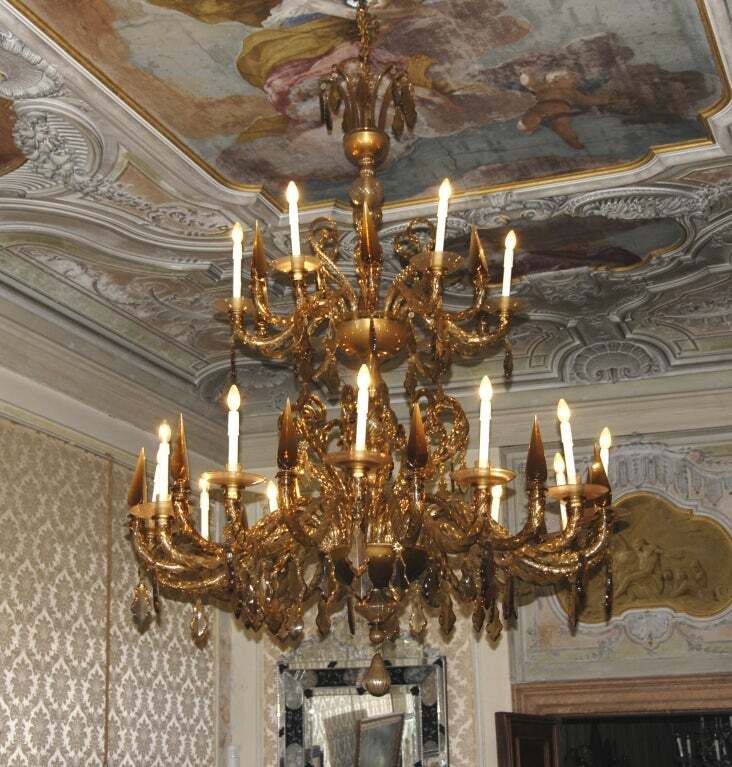 This chandelier is the only one known in existence made by Giulio and it was part of the Salviati museum in Venice Italy until removed about 30-35 years ago by the gentleman the present owner acquired it from in Venice. The gentleman that acquired the piece from the museum lives right across the street (main canal) from where the Salviati museum used to be and had it installed above his dining table that oversees the Grand Canal. The piece has remained untouched since installed and is in mint condition with no pieces missing, and is fully functional. 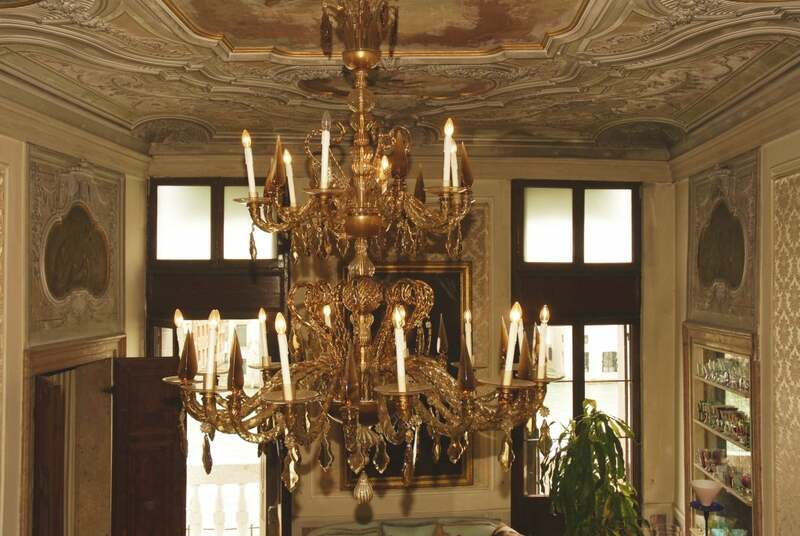 The chandelier is currently in a warehouse in Italy; please allow 6-8 weeks for delivery. Excellent original condition; no pieces are chipped, broken, or missing. 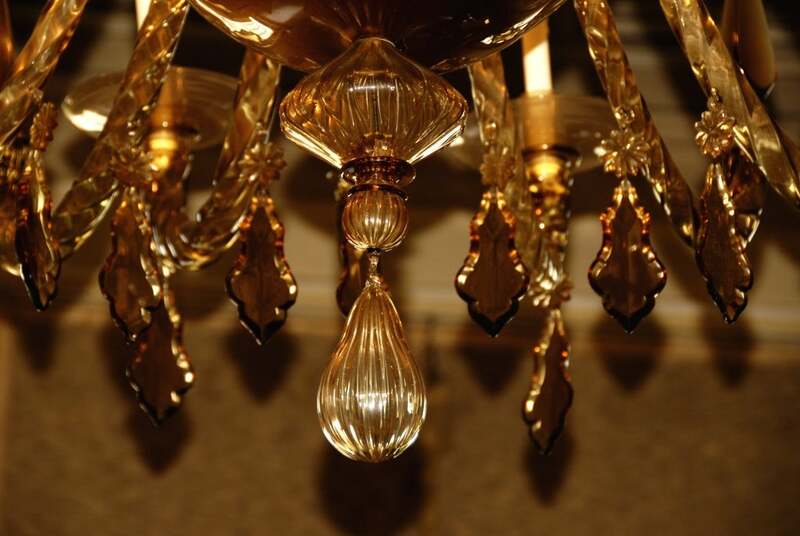 Item source and information believed to be reputable and accurate, but authenticity not guaranteed by Hoechstetter Interiors.